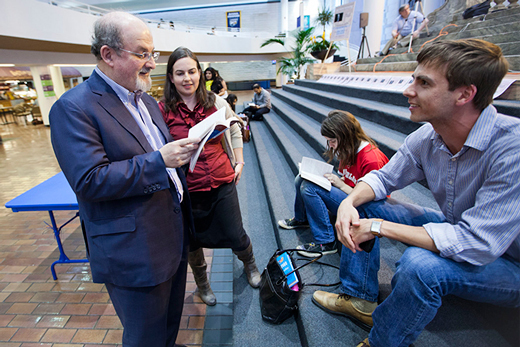 Acclaimed author Salman Rushdie (left) has served as University Distinguished Professor in Emory College since 2011, interacting with students both formally and informally. When Commencement keynote speaker Salman Rushdie launched what would become an ongoing relationship with Emory University nearly 10 years ago, it was clear the acclaimed writer had much to offer the academic community. Through classroom discussions and public forums, Rushdie would stimulate a stream of thoughtful conversations about culture, history, politics, religion, violence, poverty, creativity, film and literature — including his own historic role amid an international free speech debate, when his novel “The Satanic Verses” drew death threats and a fatwa from Iran’s Ayatollah Khomeini. But just as Rushdie brought global experiences and insight to Emory, so the university has left an indelible impression upon him. Rushdie’s relationship with Emory began when he delivered the 2004 Richard Ellmann Lectures in Modern Literature. He joined Emory as Distinguished Writer in Residence in the English Department in 2006, serving in that role until 2011, when he became University Distinguished Professor in Emory College. Now as Rushdie concludes his professorship, the award-winning author reflects upon his Emory years — a longstanding teaching role that brought benefits he never anticipated. Although he had frequently spoken at colleges, Rushdie discovered that stepping into a more formal teaching role enabled “a much more direct engagement with students,” which he grew to appreciate. During his first five years at Emory, Rushdie taught a month-long graduate seminar to a select group of students. However, in recent years his time on campus each spring was widely divided, as Rushdie assumed the role of guest lecturer, addressing multiple classrooms within an assortment of disciplines. In the end, that experience helped sharpen his own thinking. “It’s quite interesting to be obliged by the fact that you have a lecture to give, to actually work out in an organized way what your thoughts are on a given subject,” he explains. For his latest novel, “Two Years Eight Months and Twenty-Eight Nights,” set for release in September, Rushdie found himself researching the great wonder tale traditions of the East, Western folk tales and Eastern European fairytales, which he previewed in a public lecture at Emory’s Glenn Memorial Auditorium last year. Writing that lecture “really was a way of telling myself what I thought about things, and that helped in the writing of the book,” he says. But the work most directly impacted by his time at Emory was Rushdie’s critically acclaimed memoir, “Joseph Anton,” which for the first time documented his years spent in hiding following Khomeini’s 1989 fatwa. Creation of the memoir was made possible directly “because of the work of the people at MARBL (Emory’s Manuscript, Archives and Rare Book Library),” he says. When Rushdie chose to place his archive with MARBL in 2006, the acquisition launched an intensive drive to preserve not only a trove of paper materials, ranging from diaries and notebooks to notes penned on napkins, but also born-digital materials — some 40,000 files and 18 gigabytes of data gleaned from his computers. “If they hadn’t done that five-year project of organizing the work, I would have had to do it,” Rushdie says. Looking ahead, Rushdie envisions an ongoing relationship with MARBL, where he continues to add to his archive. In fact, MARBL received yet another transfer of new materials within the last year, he notes. And though having a personal archive available for public consumption can sometimes be unsettling — “It feels a little weird,” he admits — Rushdie finds a kind of satisfaction in knowing that the material has found a new life among literary scholars. In fact, whenever he visits MARBL Rushdie inevitably discovers someone using his archive. “And I sort of tiptoe away,” he says.